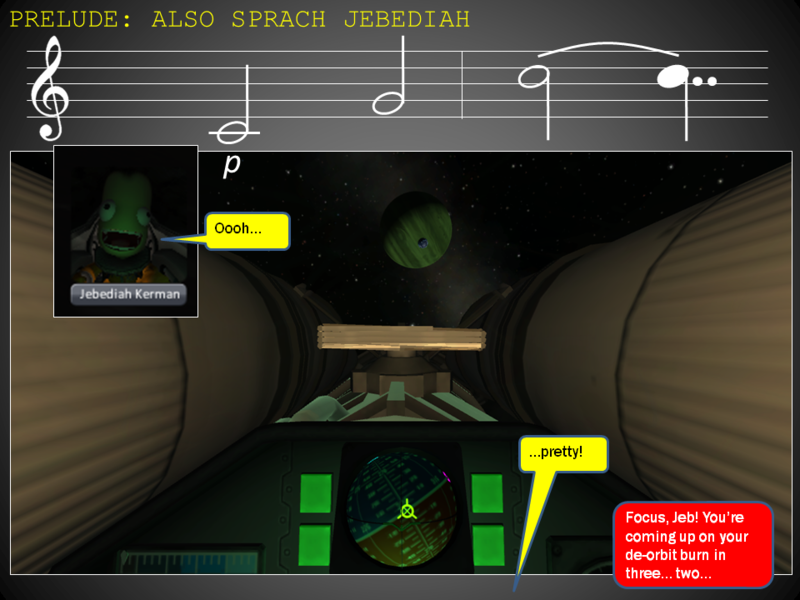 Read all of the Prelude (Also Sprach Jebediah) and Chapter One here. Read all of Chapter Two (A Capital Idea) here. Read all of Chapter Three (Of Moons and Madness!) here. Read all of Chapter Four (Intrepid Away!) here. Read all of Chapter Five (Flight Operations) here. Read all of Chapter Six (Rising Up) here. Read all of Chapter Seven (Tanks, and Farewell) here. Read the Evil Interlude "Military Intelligence" here. Read all of Chapter Eight (Inside, Out) here. Read all of Chapter Nine (Collision Course) here. Read the komplett Zwischenspiel hier. This important interlude about "the year before Year Zero" began with this post. 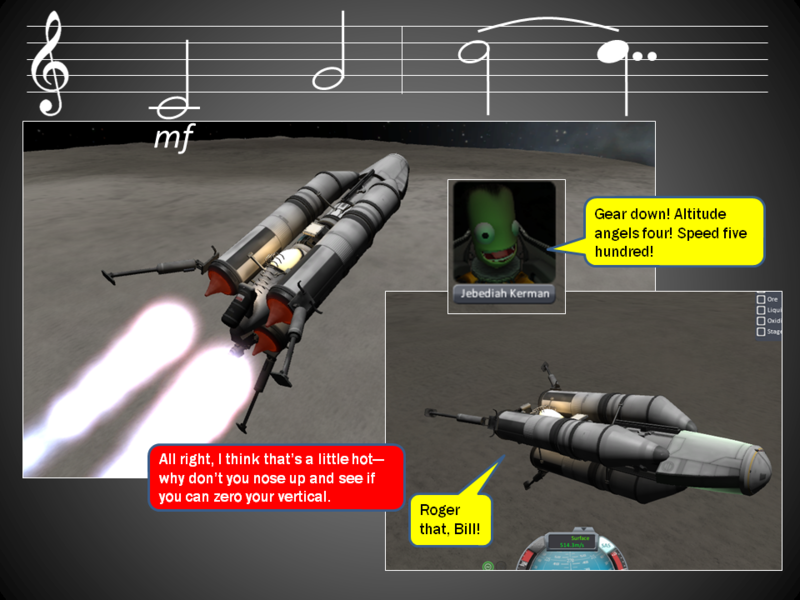 Read all of Chapter Ten (Jool At Last!) here. Chapter 11 began with this post. Read all of Chapter Eleven (Going In, and Going Down) here. Chapter 12 began with this post. Read all of Chapter Twelve (One Moon At A Time) here. The Interlude "A Cowardly Capture" appeared in this post. Chapter 13 began with this post. Read all of Chapter Thirteen (All These Worlds Are Yours) here. Chapter 14 began with this post. Read all of Chapter Fourteen (Veni, Vidi, Vale) here. Chapter 15 began with this post. Read all of Chapter Fifteen ("Til You Drop) here. The Interlude "Endgame Studies" began with this post. Chapter 16 began with this post. Read all of Chapter Sixteen (Now I Lay Thee Down) here. Chapter 17 began with this post. Read all of Chapter Seventeen (Cracks in the Mirror) here. Chapter 18 began with this post. Read all of Chapter Eighteen (Action Stations!) here. Chapter 19 began with this post. Read all of Chapter Nineteen (Their Finest Hour) here. The Interlude "(zero) gee club" appeared in this post. Chapter 20 began with this post. Read what there is of Chapter Twenty (Endgame, Part One) here. So, rather than make everyone wait for me to test all the ships and get everything right, I figured I'd take you along for the R&D ride. Hope you enjoy! I had to stop and put on the appropriate music to go with those first five panels. I think this will be very interesting. And probably a tonne of fun, too, if I know Kuzzter. And, I almost forgot - Thanks Kuzzter! This seems like it will be interesting. How many of Jool's moons do you intend to explore? Will the Kerbulans be there? No, really. Post the entire book. 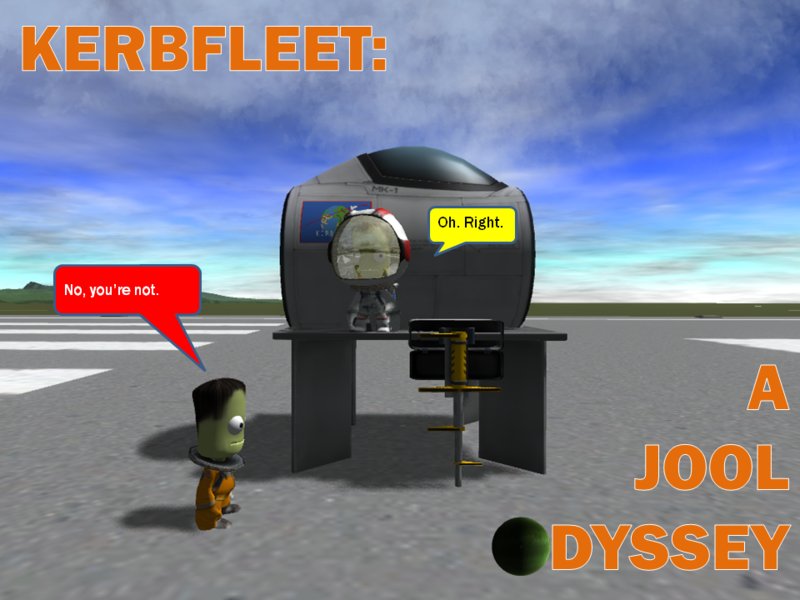 Who needs a homicidal AI when you've got Jeb? (1) All of them, of course. (2) Kerbulans? [URL="http://tvtropes.org/pmwiki/pmwiki.php/Main/ChekhovsGun"]What Kerbulans[/URL]? [quote name='Trios']No, really. Post the entire book. And there goes all hope of Dres love. Anyways, I am looking forward to the new series, and I definitely think this is going to be good. Will the Kerbulans be there? From what we know, the Kerbulans are not explorers. They don't even have names for the other planets. Also, in the last interlude Kenlie Kermulan was sent to 'the purple planet', but it was mentioned that the craft was a prototype long-range attack ship. It was also mentioned that Kenlie will not have enough fuel to get back to Kerbulus after arriving at Eve. So, it seems unlikely at this point. eta: Unless you're actually paying attention to Kuzzter. And he already ninja'd my attempted fake-out. On another topic, now that I've had a couple of minutes to peruse the panels more closely... That's one fine-looking lander! Bill is outdoing himself. 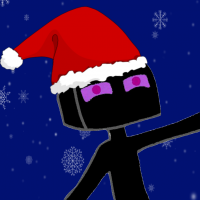 [quote name='Noname117']And there goes all hope of Dres love. There could still be a Dres flyby, maybe for fuel or something. 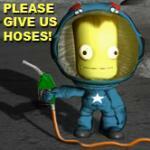 Will you be doing the Jool5 challenge? It's really cool to see the story arc change from "For Science!" to "For [s]Science[/s] Funds!" to "For [s]Science[/s] [s]Funds[/s] ???" One of the things I was doing with my spare time in my recent absence from KSP was learning to play the English concertina. 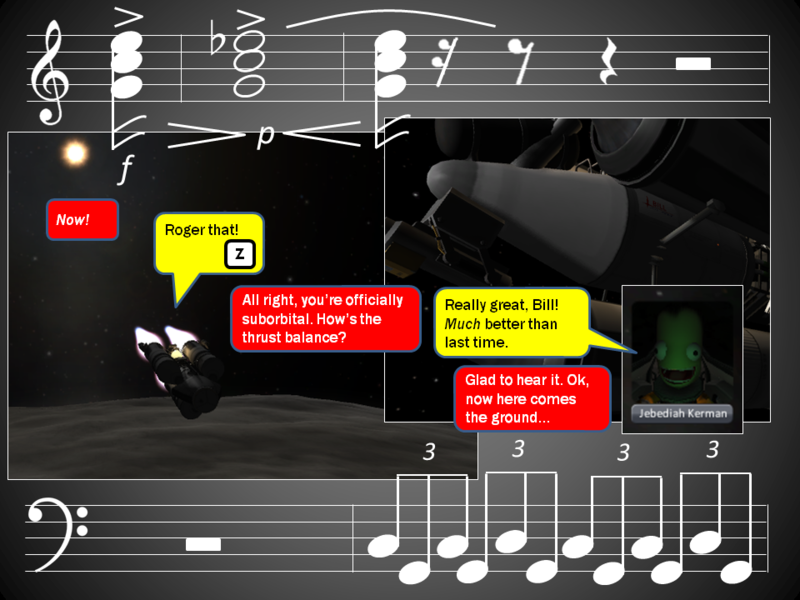 I can vouch for the accuracy of Kuzzter's score because I was playing it while reading the comic ;). Thaniks, Kuz, for the sheet music. I'd have never thought to play that otherwise. Although I think the kettledrum part sould be a few octaves lower :). I have a feeling he'll send the B-Team there. Thank you! I've actually managed to land it, though the drill didn't engage-- it might be mounted too low. We'll see if Bill or Wernher can puzzle their way out of it for me. Yes, but I am going to fit the mission to my preferences and let the chips fall where they may, rather than try to follow any specific set of challenge rules. 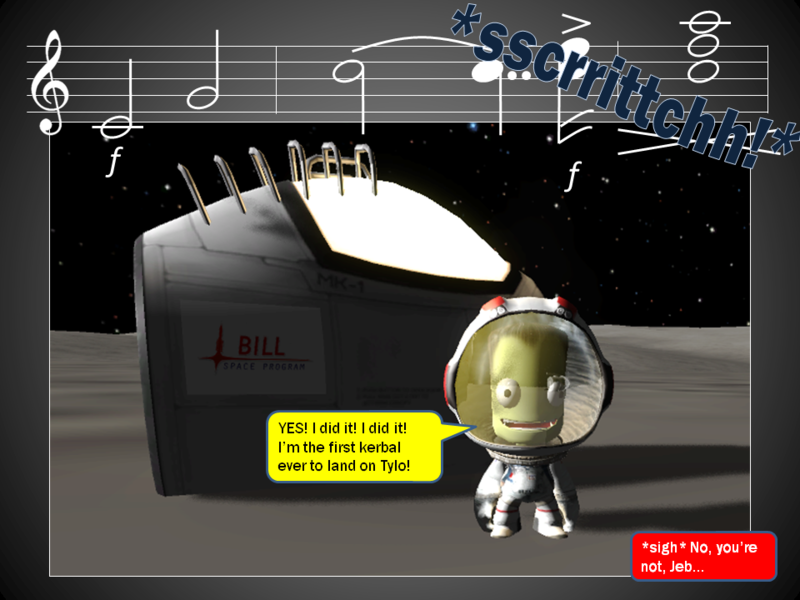 [quote name='Geschosskopf']One of the things I was doing with my spare time in my recent absence from KSP was learning to play the English concertina. 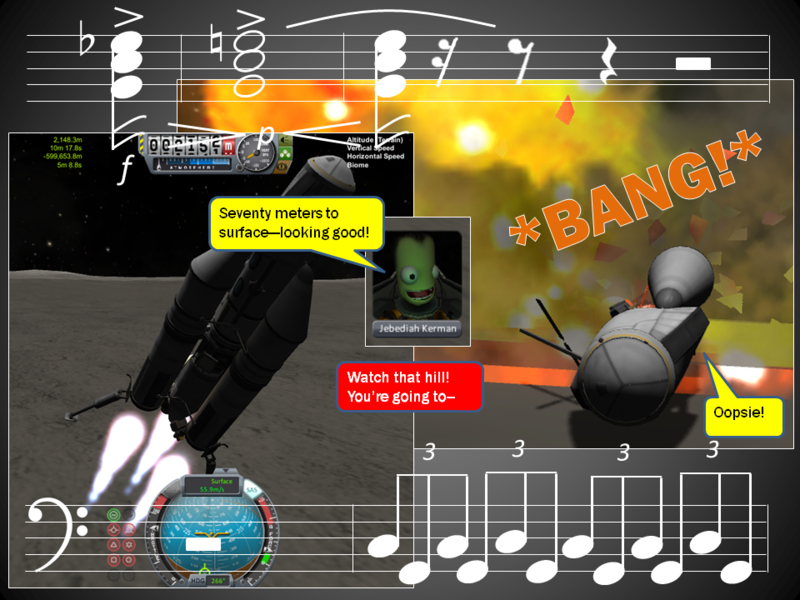 I can vouch for the accuracy of Kuzzter's score because I was playing it while reading the comic ;). It's great to see you back! I had wondered what you'd been up to. Nice to know you're putting your time to good use. That's why Gawd invented the bass clef :). Either way, it's way out my instruments tenor range, though. [quote name='Starhawk']It's great to see you back! Well, thanks. See, when you're the most interesting man in the world, you have to continue to do new and interesting things :). Except where there are volume cues written in the score :). Yay! Looking forward to more of your adventures and great story telling. Love the plot twists too!